Content marketing is a bit like planting your own wood – many blog articles over time covering a wide range of keywords and subjects, attract an ever-widening stream of relevant traffic. And once you’ve made and posted the content, the response is free forever more. This is why over time, cost per lead for content marketing is so much lower than for paid search. 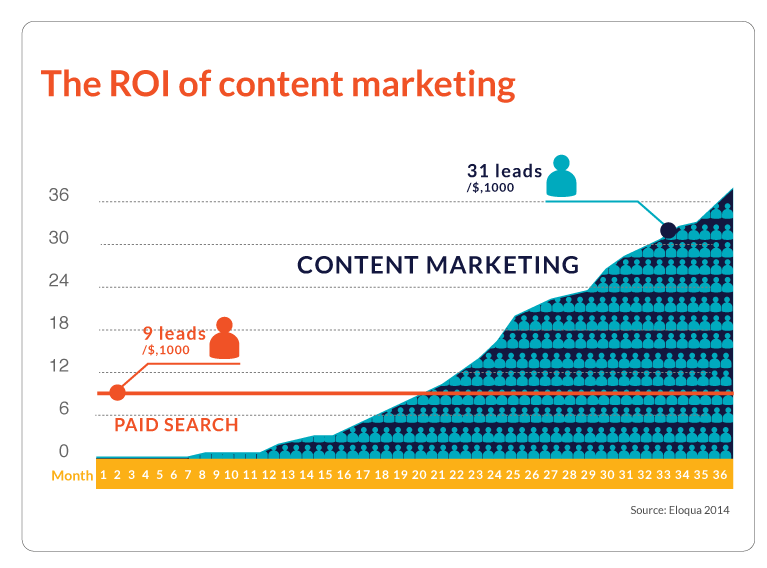 Eloqua has calculated content marketing provides more than 3x the leads than paid search for the same money. A study of 2,300 businesses by HubSpot showed that businesses that blog saw their monthly leads rise by 126% more than those who didn’t. Of course it’s not just the blog itself generating the leads through search, but also the blog posts being found through social media. There then needs to be a mechanism to turn traffic into leads (downloads & newsletter sign-ups). 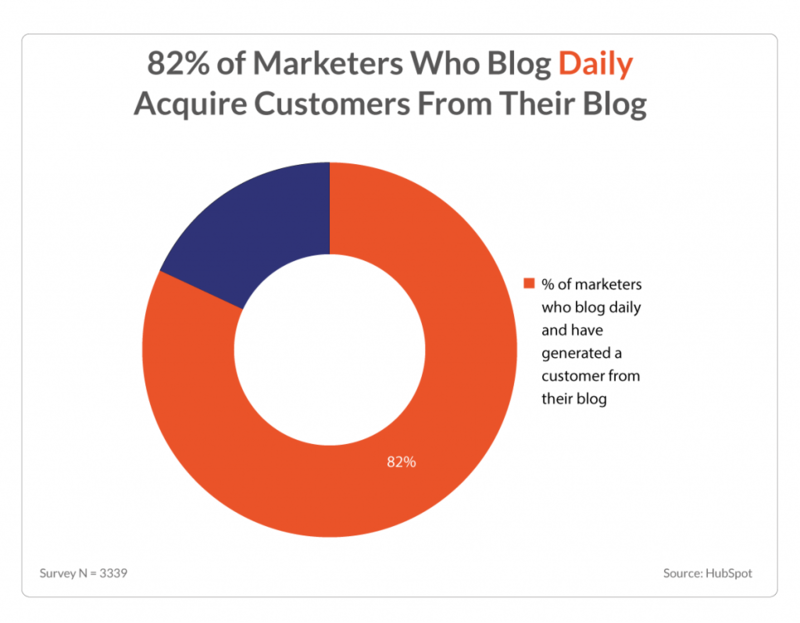 Proof from HubSpot that the more frequent the blog posting, the more customers acquired. Interestingly of marketers blogging monthly, 57% say they have acquired a customer using their blog. 1) 82% of marketers who blog daily view blogging as an effective marketing technology tool–second only to email marketing. 15% say blogging is most effective at engaging existing customers; 11% value it more for attracting new customers; and 69% say blogging is equally effective for both objectives. (e-Strategy Trends). 2) Marketers who have prioritized blogging are 13x more likely to enjoy positive ROI (HubSpot). 3) Blogs give websites on average 434% more indexed pages and 97% more indexed links. (Inbound Writer). 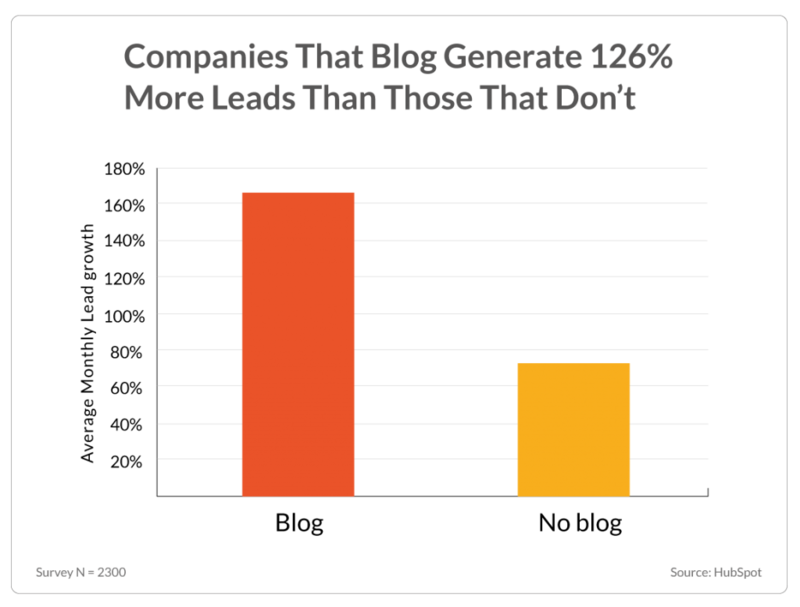 4) B2B companies with blogs generate 67% more leads per month on average than non-blogging firms. (Social Media B2B). 5) Brands that create 15 blog posts per month average 1,200 new leads per month. (HubSpot). 6) B2B companies that blog 1-2x/month generate 70% more leads than those who don’t blog. (HubSpot). 7) Companies that increase blogging from 3-5x/month to 6-8x/month almost double their leads. (HubSpot). 8) An average company will see a 45% growth in traffic when increasing total blog articles from 11-20 to 21-50 (HubSpot).